A quick bit of history on this clip, as you will see the below clip is in colour, the original pre-recorded clip was broadcast "as live" and using a green filter to make it appear as if it was in night vision. 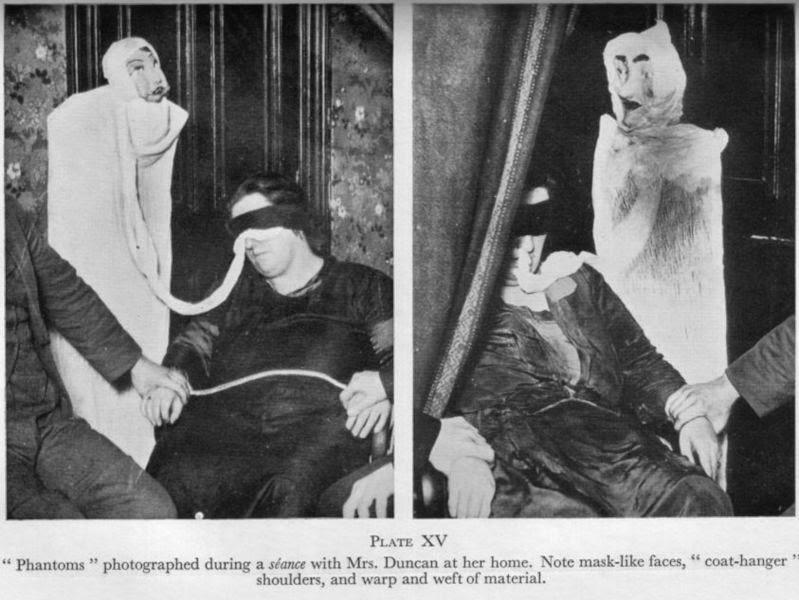 Most Haunted would often do this on the Most Haunted Live events as a way to fool the gullible viewers. BadPsychics originally released this clip as a way to prove the show would fake scenes, the clip was recorded from an un-encrypted satellite feed, which an associate of ours had tuned in on. We originally claimed that a member of the staff or "The Most Haunted Mole" had sent us a video tape, this was designed to cause disruption amongst the Antix crew, and it did with Karl Beattie holding many a meeting about this mystical figure, I took great pleasure in pulling the wool over his eyes! "At around 7:45pm on April 21 2003 (the day before her 17th birthday), Amanda Berry left her job at a Cleveland area Burger King. She called her mother on her cell phone, told her that she had gotten a ride, and would call right back." Amanda's mother Louwana Miller would appear on the Montel Williams Show a year and a half later, to get a reading from Sylvia Browne about her missing daughter, whereby Sylvia said the following. "Miller: So you don't think I'll ever get to see her again? Browne: Yeah, in heaven, on the other side." "On May 6th, 2013, Amanda Berry, along with two other young women (Georgina DeJesus and Michelle Knight), was found alive and being held captive in a house in Cleveland." Unfortunately, Amanda's mother did not live to see this day. So just think about that for a second, a Mother died believing her daughter was dead because Sylvia Browne told her so. If I believed in Hell, then I know that Sylvia Browne would be right there. But instead she is dead, and the only comfort we can take from that is that Sylvia can't hurt any more people with her lies. For many many years fake psychic Joe Power did everything he could to become famous, but failed at every turn, but he did garner a modicum of celebrity when Shannon Matthews went missing. 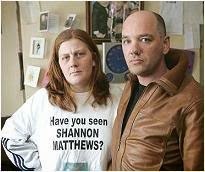 With the Maddie McCann disappearance still firmly in the minds of the general populous, when a young girl called Shannon Matthews on the afternoon of 19 February 2008 in Dewsbury, West Yorkshire, England disappeared the media lapped it up, and when Joe Power managed to get in with Shannon's mother, we suddenly had Joe front and center in the news, lots of photos with Shannon's mother. "Shannon was found on 14 March 2008 at a house in Batley Carr, a short distance from Dewsbury. The house belonged to 39-year-old Michael Donovan, uncle of Craig Meehan - the boyfriend of the kidnapped girl's mother, Karen. The kidnapping was subsequently discovered to have been planned by Karen and Donovan in order to generate money from the publicity. Donovan was to have eventually "found" Shannon, taken her to a police station and claimed the reward money, which would be split between Donovan and Karen." Joe fledgling career never recovered after this, just imagine it, child goes missing, perfect opportinty for a psychic to get in the news with some vague comments, but that one photo above, did as much as anything else to end Joe's Psychic TV career! I hear he still does small shows in front of 40-50 people, so if you see him advertised, perhaps you should remind the organisers of this mans failed record. "Tony Robinson And The Blitz Witch"
The documentary was mainly about fraudulent physical medium Helen Duncan, however during the show a medium by the name of Darren Brittain was featured. There is single sentence claim on his website. "His reputation for delivering names, dates, street names, and personal information to identify loved ones has earned him a reputation as a medium of high quality." And that is exactly what he had done. Before he was known as Colin Fry, he was known as Lincoln, and worked as a physical medium in the early 90s. As the story goes Colin was conducting a seance, in the dark of course, with a bunch of spiritualists, believers and other psychics, suddenly in the middle of the seance, the lights were switched on, and there was Colin stood up having escaped his bonds, waving a spirit trumpet in the air. He had been caught red handed. He was then exposed by The Psychic News! Below are scans of the original article. 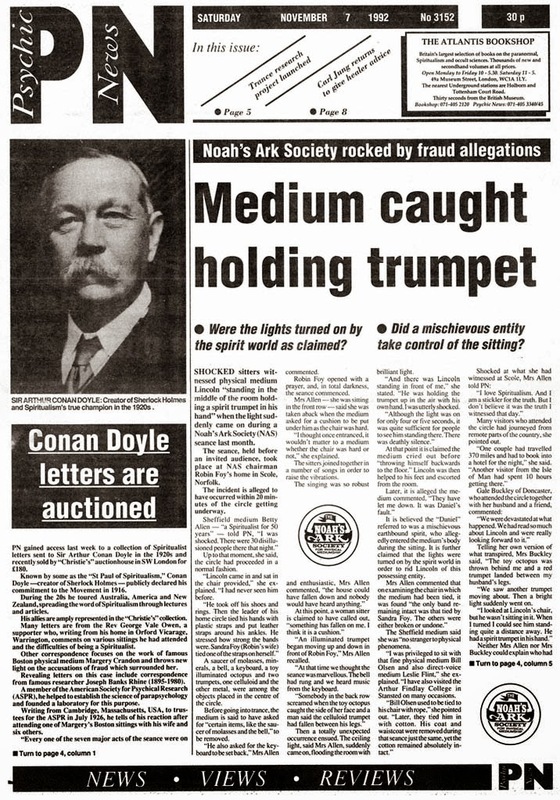 Despite being catagorically exposed as a fraud by his own peers, he changed his name, moved away from public demonstrations of physical mediumship and into the TV world of stage mediumship, he went on to have a relatively successful career on cable tv channels, but one thing he could never truly live down was the moment he got caught cheating, which became affectionately known as "The Trumpet Incident"
"James Allen Hydrick (born February 28, 1959) was a former American performer and self-described psychic. Hydrick claimed to be able to perform acts of telekinesis, such as his trademark trick of moving a pencil resting at the edge of a table. He became famous after a nationally-televised demonstration of his abilities on the American reality show That's Incredible!" And he would have gotten away with it if not for that annoying little beardy skeptic James Randi! Geller is a personal favourite of mine, I always loved his gimmick and his act. And inadvertently, by failing to demonstrate any psychic abilities on Johnny Carson show, Uri Geller actually became ten times more famous! Lets take a look at what happened. "In 1973, Johnny Carson had a legendary run-in with psychic Uri Geller when he invited Geller to appear on his show. Carson, an experienced stage magician, wanted a neutral demonstration of Geller's alleged abilities, so, at the advice of his friend and fellow magician James Randi, he gave Geller several spoons out of his desk drawer and asked him to bend them with his psychic powers. Geller proved unable, and his appearance on The Tonight Show has since been regarded as the beginning of Geller's fall from glory." "Peter Popoff (born July 2, 1946) is a German American televangelist, and self-proclaimed prophet and faith healer. He conducts revival meetings and has a national television program. He initially rose to prominence in the 1980s. In 1986, skeptics James Randi and Alexander (Alec) Jason exposed his method of receiving information about revival attendees from his wife via an in-ear receiver." There are simply too many ridiculous moments in the history of Spiritualism and Psychics to mention in a top 10 list, but I thought it only fitting to have those who started it all at Number One! 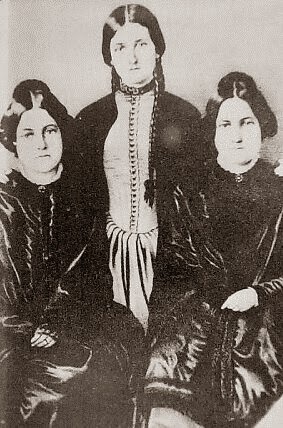 "The Fox sisters were three sisters from New York who played an important role in the creation of Spiritualism: Leah (1814–1890), Margaret (also called Maggie) (1833–1893) and Kate Fox (1837–1892). The two younger sisters used "rappings" to convince their much older sister and others that they were communicating with spirits. Their older sister then took charge of them and managed their careers for some time. They all enjoyed success as mediums for many years. In 1888 Margaret confessed that their rappings had been a hoax and publicly demonstrated their method. She attempted to recant her confession the next year, but their reputation was ruined and in less than five years they were all dead, with Margaret and Kate dying in abject poverty. Spiritualism continued as if the confessions of the Fox sisters had never happened." So there you have it, the very people who started modern spiritualism were self admitted frauds! But without them you wouldn't have anyone else on this list I am sure! So next time you hear someone call themselves a psychic, a medium, a faith healer, or whatever, just nod your head, walk away, and don't waste your time engaging them at all! Keep up the good work, psychics, spirit healers, astrologists, reading tea leaves, meridian lines and all that other unproven and unjustifiable nonsense has no place in this world. It's gone on for too long.